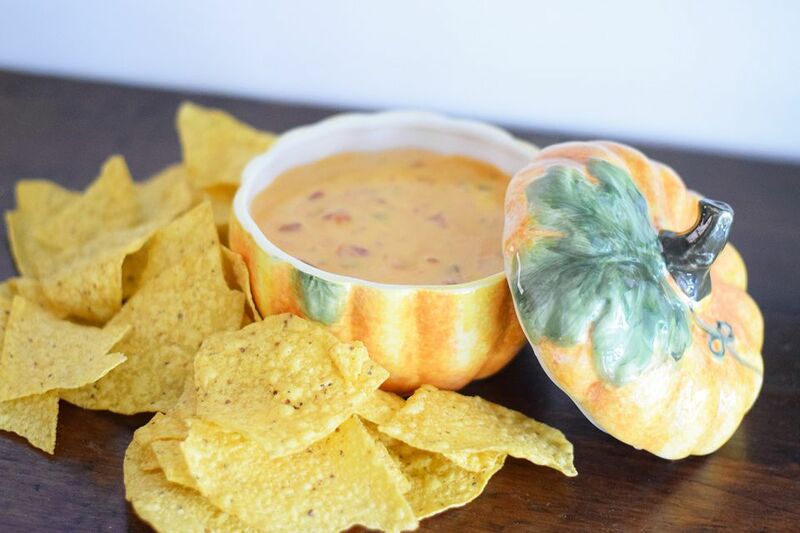 Chipotle, pumpkin, and cheese come together in the deliciously spicy, and velvety dip. It's the perfect fall party snack, with pumpkin puree perfectly complimenting the smoky chipotle peppers. Some may sneer at Velveeta, but it really makes the perfect base for any Mexican style cheese dip. You can also substitute with American cheese. They both will maintain a creamy texture without separating. Cut the Velveeta cheese into roughly 1-inch cubes and place the cheese into a microwave-safe bowl. Add the can of Rotel tomatoes and chiles, including the juice from the can, to the cheese. Then, add the pumpkin puree. Stir gently to just combine. Chop the chipotle chiles into a fine dice and add them, plus 2 teaspoons of the adobo sauce from the can, to the cheese mixture. Stir the mixture. Place the bowl in the microwave and heat for one minute. Remove from the microwave carefully and stir. Microwave for one minute intervals, stirring in between until the cheese has completely melted and is hot. Serve the queso with tortilla chips or vegetable sticks. If the cheese becomes firm after serving, simply microwave for another minute. You can easily find canned chipotle peppers in most grocery stores. Check the imported aisle if you can't find it with the taco ingredients. The chipotles are packed in a smoky adobo sauce that has a delicious and unique flavor that tastes amazing in this cheese dip. A little goes a long way, so you only need 1 to 2 teaspoons of the sauce. Some chipotle peppers are hotter than others and there is really no way to tell when you buy the can. Taste them before adding if you are worried about them being too spicy. You can also avoid adding the seeds from the chile if you want to cut down on the heat. Canned pumpkin puree tastes delicious in this recipe, but you can also make a homemade one as well. Roast the pumpkin, scoop it out and add to the cheese sauce. You can also replace the pumpkin for butternut squash puree or even sweet potato. They all have similar textures and flavor profiles.